Roy William Roach Sr. was born on August 22, 1927-in Axton, VA. Died February 10, 2019 at the age of 91. Beloved husband for 42 years to the late Margaret “Dolores” (nee McMahan) Roach. Beloved father to Deborah (Rudy) Meyer and Roy William Roach Jr.. Pappaw to Ryan Matthew and Jacob McMahan Meyer and PawPaw to Nathan Jack and Nicholas William Roach. Dear Son of the late James and Sarrah Roach and dear brother of the late James and Ralph Roach, Sr. 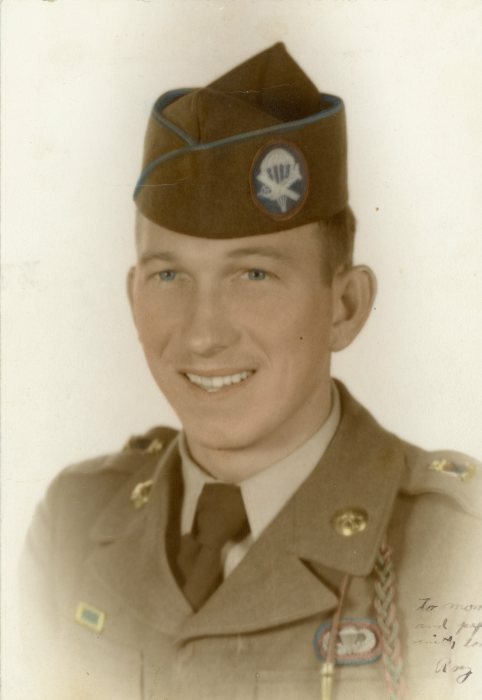 Proud Korean War Veteran, he served as a Paratrooper in the 82nd Airborne Division. He retired as a bus driver from Greyhound Bus Lines after 35 years of service. Visitation will be held on Friday, February 15, 2019 from 10am until the time of the funeral service at 12pm at Paul R. Young Funeral Home, 7345 Hamilton Ave., Mt. Healthy, Ohio 45231. Interment to follow at New Harmony Cemetery. Memorial contributions may be made to CancerFree KIDS at 420 W. Loveland Ave. #105 Loveland, OH 45140.